So, clearly there’s been quite a lull in our postings, and what’s more, at a time in which so much has transpired. I won’t attempt to recap the last two months. Truly it would be impossible. That, and I was inconveniently absent for most of it. My summer constituted navigating a frontier lake, escorting travelers to frigid and inhospitable emergency rooms, climbing to dizzying heights and learning and performing new dances with four minutes warning. It was a whirlwind tour, and in many ways, coming back to Ollantaytambo and to the young women of the dorm has been a greater change than I could have imagined. Everything has stopped, slowed down, a transition that at first I felt hesitant of, but which now fills me with daunt and excitement. The girls and Maura are phenomenal and have been thriving throughout the last 2 months. A generous Rustic student from the past year made a trip down to Peru this last June to donate several computers, and Rustic students from this 2010 season collaborated, and gave the dorm the gift of Internet. The girls, of course, thrilled. Aside from our newest class, computation, which they absolutely adore, trying to pry them away from practicing their typing and surfing the web is a wearying chore in itself. As before mentioned, there are so many things that I could note in this blog, But I should choose some direction, a daunting task, and stick to one theme. 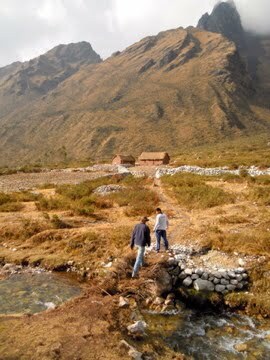 Last weekend, Alex, Edwin (our Quechua translator) and I took off on a three-day trek with the purpose of introducing our project to certain distant communities, and continuing the search for prospective students for the upcoming 2011 year. I say continuing, because the selection process and needs assessment profiles were established by Joe and Christie this past summer. Our hike began Friday morning, circa 9:30am, out of the community of Camicancha. We made our way up a dramatic and breath-taking canyon towards the community of Angascocha. A grueling hike, with a fair vertical ascent in which I painfully learned that my pride can easily be conquered by harrowing hikes. 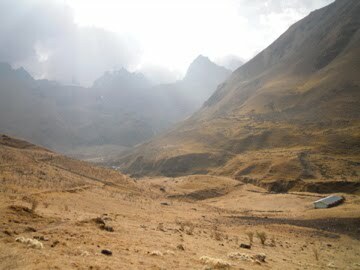 But despite a mild urge to die, I made it to Angascocha; we made it to Angascocha, by the early afternoon. Since coming back from our trek, I have described the community of Angascocha as a harsh and barren land, likened it to being in another world, the moon per say, an inhospitable and abrasive territory. The primary school, alone in the midst of a monotonous pampa, only benefits seven children. As we quickly found out, the people of Angascocha themselves were all eerily missing, and one individual noted that most families were migrating towards the larger and more fertile communities of Camicancha and Chillca. In all, we found no prospective students for next year, and the few girls we came across, sheep herding, couldn’t have been more than 8 years old. Our second day took the three of us over the 4600m pass of Wayaray. A beautiful lagoon lay beneath the snowcapped range, and I quickly found respite and relief from the delicious waters of a glacier runoff. After a much needed siesta at the pass, we set off down towards the community of Qhesqa. My first impression upon arrival was that their houses reminded me ever so slightly of Smurf homes. 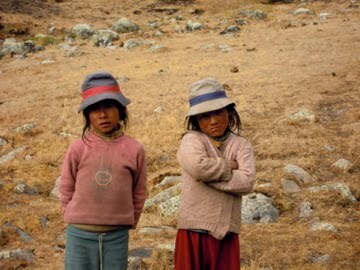 At any rate, the town of Qhesqa resides a few hours off the infamous Inca Trail, and is comprised of a great deal more families than Angascocha. We set off on our rounds, visiting families previously profiled by Joe and Christie, and meeting some new families and students along the way. I found the process of talking to the parents indirectly via translator to be a bit unnerving, and in all, I didn’t find our outreach to be the most successful. But it was something, and the following day managed to make me feel as though the trip was a success and served it’s purpose. So, without further adieu, on to the next day. The following day, we were fortunate to be included in a reunion of all the families within Qhesqa. First we met with the President of Qhesqa, a modest and quiet man, explaining to him who we were, why we were there, and talking openly about the families and individuals whom would most benefit from our project. At the meeting itself, we were introduced to the community by the President, after which Alex gave an eloquent and apt speech explaining concisely who we are and what our project is dedicated to. I was fairly proud of Alex and of the positive headway we had started to make in this town and region. In all, it was a gratifying three-day hike, with purpose. We scurried back along the Inca trail towards Km 82, jumped in a taxi, cruised into Ollanta, ate a delicious chicken and slept. 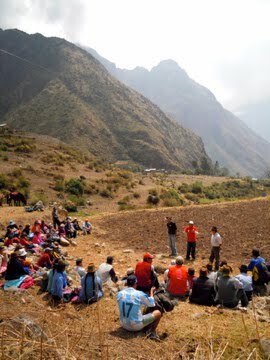 For the upcoming weekend we’re thinking of taking another hike out to the communities of Pilkabamba and Marcuray. I look forward to it tremendously.